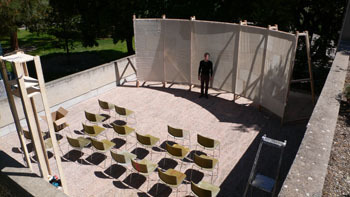 Tristan's 37 Degrees South Knitwear Brand received a commission to knit a patchwork projection screen that has been erected in France for presentations during 2014. 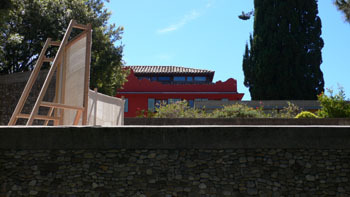 ACME = A Company That makes Everything! 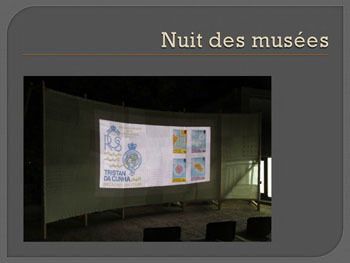 during a museum display Another image projected onto the screen. 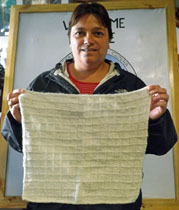 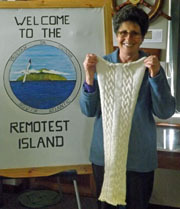 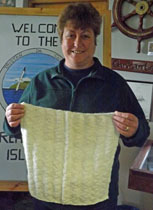 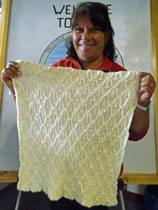 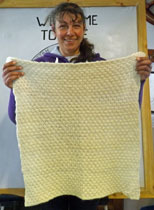 Tristan da Cunha likes a challenge so the knitters of the 37 Degrees South Knitwear Brand were delighted to receive a challenging order for an island wool patchwork screen. 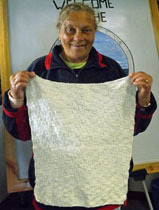 This began when Mr Cyril Verde contacted Tristan's Postmistress Iris Green to see if a screen could be produced for him to exhibit in France. 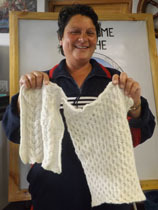 In 2012 the details passed to Tourism Co-ordinator Dawn Repetto and the formation that year of the bespoke knitting team and the re-branding of Tristan's woollens as 37 Degrees South Knitwear meant that anything was now possible. 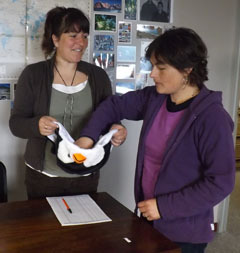 Dawn liaised with Mr Verde and Mr Sebastien Remy regarding their exact requirements. 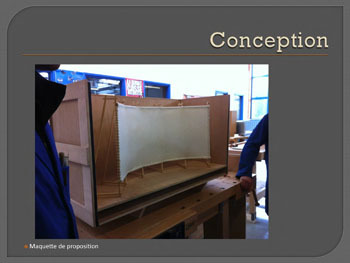 Dawn received a sketch to give an idea of what the screen might look like, and the dimensions of 560cm X 220cm. 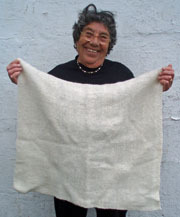 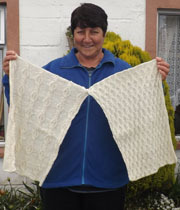 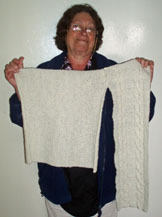 It was then drawn to scale by Shirley Squibb containing fifty seven patches. 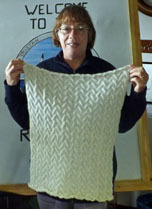 After being approved by Mr Verde and Mr Remy no less that forty eight Tristan Island knitters were briefed to begin production. 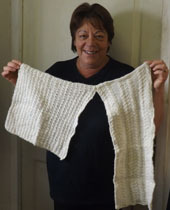 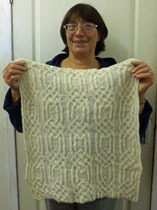 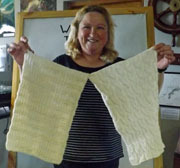 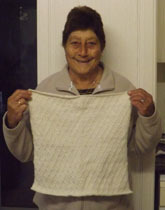 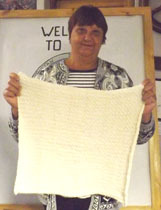 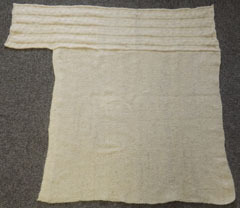 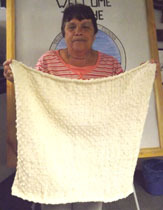 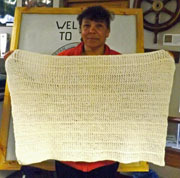 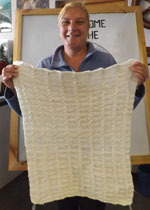 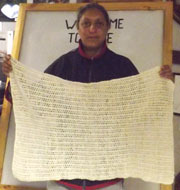 Each patch was a specific size and pattern, therefore to ensure fairness there was a draw issuing each knitter with her piece, nine of whom were given two of the smallest segments. 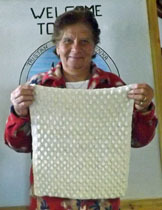 Then the eager ladies got to work and before long the patches started arriving at the Tourism Centre. 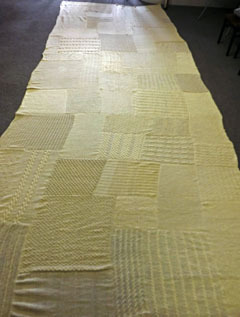 They were then sewn together as they and the screen soon started to take shape, growing at an incredible rate until it was completed on Tuesday 26th November. 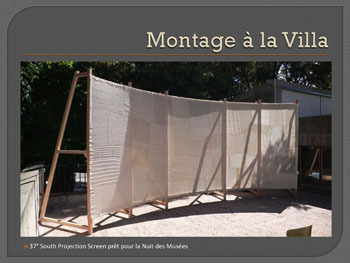 The screen has now been dispatched and the island eagerly awaits news of its safe arrival and of its exhibition in France. 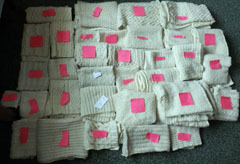 The Tristan Knitwear Team want to hear from any one else with a special woollen product in mind. 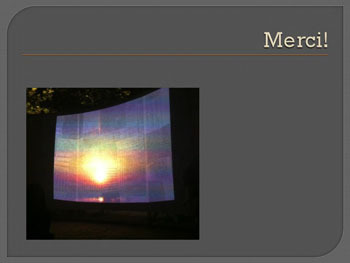 the 560cm X 220cm screen. 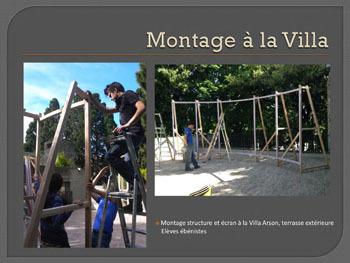 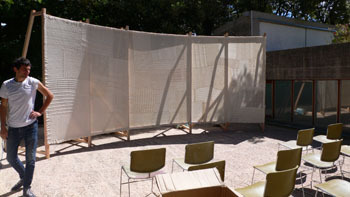 Right: The completed 560cm X 220cm screen.